The online gambling industry has already stretched to so much extent that dispensing rewards online has become reachable within just a few clicks through a Bitcoin dice faucet. The term was derived from the real water faucet. The thing is, Bitcoin dice faucet dispenses not water but an amount of the Bitcoin crypto currency. While it takes some time to accumulate a significant amount of bitcoins, anyone can use the free bitcoins given out by a site’s faucet to test the waters of playing a Bitcoin dice game. This is something that presents lots of opportunities to those who want to experience playing with the cryptocurrency. Meanwhile, those who are adept at Bitcoin gambling can use these faucets to improve their chances of winning more rolls. What’s not to love here? What a Bitcoin dice faucet does is reward users with small amounts of bitcoins. Yes, these are just small amounts, so don’t expect to get huge sums of free BTC from any faucet. But no matter how little they are, these sums of free bitcoins are all worth it since you can get them simply by completing an easy task or a captcha. As a matter of fact, some sites won’t even require you to get something done before you receive the free BTC; the moment you load their dice game, the faucet instantly puts an amount of Bitcoin to your player balance. Furthermore, the amount varies from site to site. For instance, while some of the best Bitcoin dice sites like Primedice offer free 0.000001 BTC, others give off 0.0000025 BTC such as DuckDice. These are smalls sums, indeed, but they should be enough for you to have something to start the dice game with. Also, the frequency at which visitors and players can claim from a Bitcoin dice faucet depends on the site. The intervals can range from a few seconds to a few minutes. For example, as PocketDice dispenses free bitcoins per claim every 10 minutes, 999Dice has a faucet active every 2.5 minutes. On the other hand, you will find some sites which set a maximum number of faucet use daily. When you visit one of these, you will notice that the game doesn’t give a regard to how often you can claim free BTC, but rather to how many times you are allowed to use the faucet per day. Not surprisingly, there are sites with no Bitcoin dice faucet at all like SatoshiBones. Although these sites are faucet-less, they offer you some compensatory features like a low house edge, anonymous gameplay, and wallet-to-wallet payments. 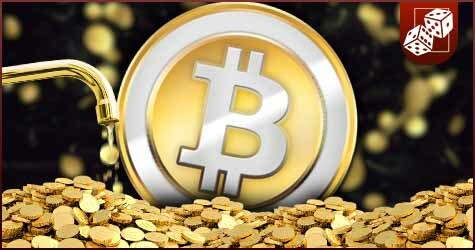 The attractive features of Bitcoin dice sites with faucet goes way beyond the free bitcoins. A Bitcoin dice faucet allows you to step inside the dice-rolling action enjoyed by many bettors at no cost. This means you get to experience a free Bitcoin dice game by betting the bitcoins you receive from the faucets. At least now you know that trying out a dice game won’t require you to risk your own bitcoins. More than that, you can start multiplying your bitcoins with the free-play tokens you get from the Bitcoin dice faucet. Take note: This is not just some free play but an actual chance to win real money using free bitcoins. That is why whenever you browse the web for some dice-rolling experience, never forget to check whether or not each dice site you log on to has a Bitcoin dice faucet. When it has, there is nothing to lose when you take advantage of the free BTC its faucet dispenses. Who knows? Your rolls owed to the faucet might just be your lucky shots at bagging big wins without having to spend a single satoshi from your own Bitcoin wallet.